Good news for all of you Calvin & Hobbes fans out there. Reclusive creator Bill Watterson is finally releasing new public work. Watterson has created the poster for Stripped, a new documentary film that discusses the state of comic strips and features interviews with a few of my personal favorite cartoonists, such as Danielle Corsetto (Girls with Slingshots), Jim Davis (Garfield) and Bill Amend (Foxtrot). 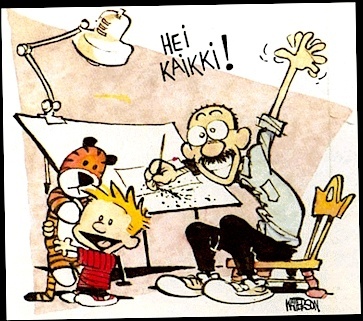 I can’t believe it’s been almost TWENTY years since the last Calvin & Hobbes strip… I feel old now. Marvel and Netflix have announced that their new, original series will be shot in New York City. The four previously announced series will feature Daredevil, Luke Cage, Jessica Jones and Iron Fist. A fifth series will include all four heroes teaming up as The Defenders (think Avengers, but on a less global scale). This does, of course, mean that once again the Big Apple will get the crap kicked out of it by super-powered villains. If they were actually rebuilding New York as often the comics would have us believe, I think that the roads would be in far better shape. With the latest sales numbers putting Xbox One solidly in second place behind the PS4, Microsoft has recently been considering cutting the price of the Xbox One. Conventional thinking says this is probably a good idea, since the Xbox One costing $100 more than the PS4 is probably a significant factor in the sales figure differences. At least one person, Erik Kain of Forbes, doesn’t agree with this. Kain thinks that maintaining the price, but selling the system in bundle packages with games is the best route. This will maintain the profitability of the console without significantly increasing costs for Microsoft, as well as helping to promote their big-name, exclusive titles, like Titanfall. What I found most interesting is that some people are actually pushing for Microsoft to dump the Xbox brand entirely. Even if the console is sitting at number two, I can’t fathom why they would do that.